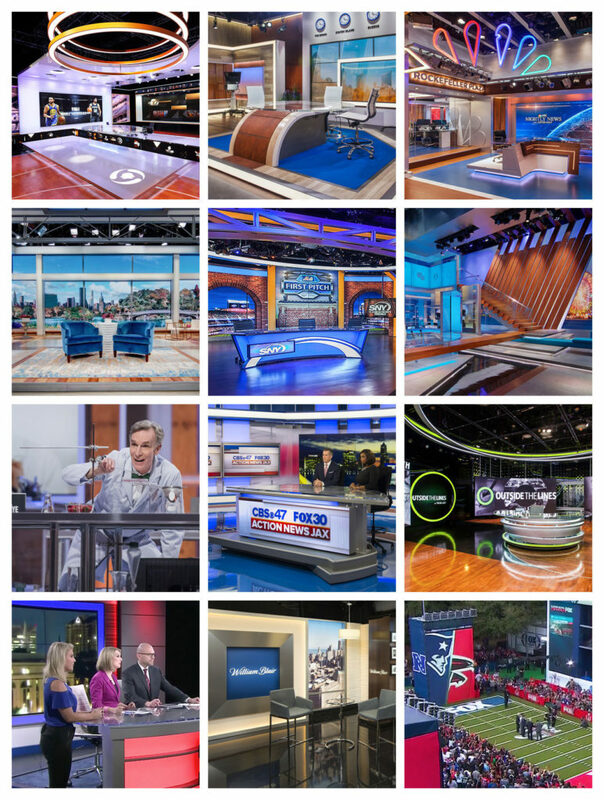 NewscastStudio’s Set of the Year competition, which launched in 2009, honors the very best in scenic design for television news, sports and entertainment programming, along with lighting design and augmented/virtual reality design. Past winners have included local television stations, sports networks and international broadcasters. Welcome to the NewscastStudio Set of the Year competition. Winners were announced during the 2017 NAB Show. View a full list here. NewscastStudio, the trade publication for broadcast industry professionals involved in production, design and engineering, has announced the winners of its 2017 Set of the Year competition — an annual contest that showcases the best in broadcast design, technology and lighting from organizations across the globe. This year’s Set of the Year awards were judged by a panel of 15 industry veterans with over 200 years of combined experience in broadcast design, production design and the broadcast industry. Clickspring Design took home the most accolades, with five total honors, including two awards for work completed for Tencent (腾讯体育), a leading technology and internet company based in China. Other winning broadcasters included ESPN, Fox Sports, NBC News, Cox Media Group, Gray Television and Netflix. “NBC Nightly News” from Clickspring Design took home the National category honors, with New York’s Spectrum News NY1 from Jack Morton Worldwide awarded the top honor in the Local News category. Internationally, Suzhou TV’s (苏州电视台) Media Center from Clickspring Design was the judges’ pick, while the design for Fox Sports’ coverage of Super Bowl LI from JHD Group won in the Special Event category. Tencent’s NBA studio took home the top honors in the Sports category and the Augmented Reality/Virtual Reality category, with design from Clickspring Design and graphics by Girraphic with graphics technology from Vizrt. Meanwhile, James Pearse Connelly’s studio for Netflix’s “Bill Nye Saves The World” took top honors in the Entertainment category. The Set Technology category, a new addition to the awards program this year, included winning work from Devlin Design Group at Cox Media Group’s WJAX in Jacksonville, Florida, where the video wall usage was honored, integrated by Advanced. Clickspring Design’s usage of curved, tracking LED video walls in ESPN’s Studio Z, home of “Outside the Lines” with Bob Ley and “E:60,” also garnered honors, with integration by AV Design Services. “LED video walls continue to dominate broadcast design — and designers are now faced with the challenge of finding innovative ways to use them,” said Dak Dillon, editor of NewscastStudio. The Lighting Design category, which focuses purely on the lighting of a broadcast studio, saw two awards for The Lighting Design Group. The winning work includes “Megyn Kelly Today,” an entertainment show airing on NBC, and New York’s SNY, a sports network covering the New York Mets and Jets. Financial services firm William Blair’s Chicago-based set from Provost Studio won the Webcast category, which honors work designed primarily for usage in online streaming productions. For the reader’s choice Fan Vote, which garnered nearly 20,000 votes, NewscastStudio.com readers picked FX Design Group’s work for WCTV in Tallahassee, Florida, a Gray Television station. The complete list of winners, including the judges’ picks for honorable mentions, is available online at http://nca.st/soty2017. The winners were announced at the 2018 NAB Show in Las Vegas, Nevada.